Growing retail and hospitality sectors, rising construction activities across airports, metros and new housing societies along with increasing establishment of SMEs and commercial hubs have fueled the growth of India air conditioners market. Additionally, growth in construction market and increasing government spending towards public infrastructure would further enhance India Air conditioner market forecast revenues over the coming years. Though the prices of air conditioners are increasing in India, however, companies are offering various kind of schemes such as EMI and seasonal discounts which are attracting middle class population of the country. The India Air Conditioner market is broadly divided into seven segments, within that split air conditioner segment dominates the market and would continue to lead throughout the forecast period. The demand for these air conditioners are primarily growing in the residential market. The VRF/VRV segment is also gaining popularity in the market. In India, the Northern region has captured major India air conditioner market share followed by the Southern and Western regions. The India air conditioner market report thoroughly covers the India air conditioner market by types, by applications and by regions. The India air conditioner market outlook report provides an unbiased and detailed analysis of the India air conditioner market trends, opportunities/high growth areas, market drivers, which would help the stakeholders to device and align market strategies according to the current and future market dynamics. •	Historical & Forecast data of Global Air Conditioner Market for the Period, 2014-2024F. •	India Air Conditioner Market Size and India Air Conditioner Market Forecast of Revenues for the Period, 2014-2024F. •	Historical & Forecast data of India Window AC Market Revenue & Volume for the Period, 2014-2024F. •	Historical & Forecast data of India Split AC Market Revenue & Volume for the Period, 2014-2024F. •	Historical & Forecast data of India Ducted AC Market Revenue & Volume for the Period, 2014-2024F. •	Historical & Forecast data of India Package AC Market Revenue & Volume for the Period, 2014-2024F. •	Historical & Forecast data of India Floor Standing AC Market Revenue & Volume for the Period, 2014-2024F. •	Historical & Forecast data of India Cassette AC Market Revenue & Volume for the Period, 2014-2024F. •	Historical & Forecast data of India Centralized AC Market Revenue for the Period, 2014-2024F. •	Historical & Forecast data of India Air Conditioner Market Revenue, By Applications for the period 2014-2024F. •	Historical & Forecast data of India Air Conditioner Market Revenue, By Regions, for the period 2014-2024F. 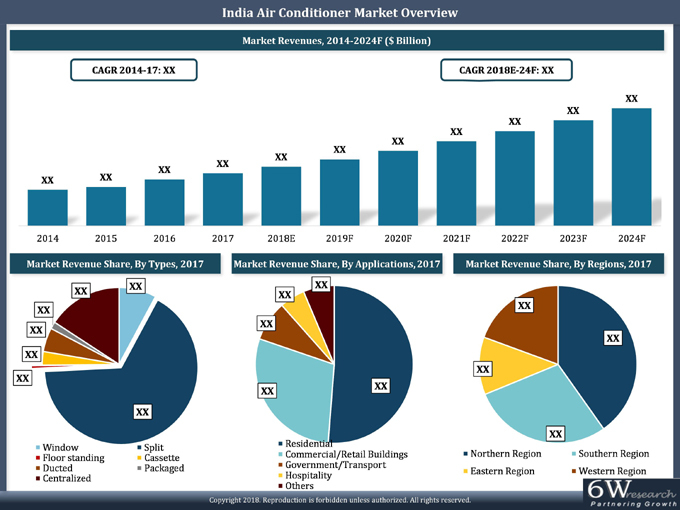 •	India Air Conditioner Market Drivers and Restraints. 12.2 Daikin Airconditioning India Pvt. Ltd.
12.4 LG Electronics India Pvt. Ltd.
12.8 Panasonic India Pvt. Ltd.